“T minus three minutes.” There was my cue to head upstairs. It took two and a half minutes to get to the roof deck (I’d measured this before) plus another 30 seconds to set up the camera. Cutting it close, but I wanted to spend as little time in the freezing cold as possible, while also seeing the rockets. It was early morning, March 27th. 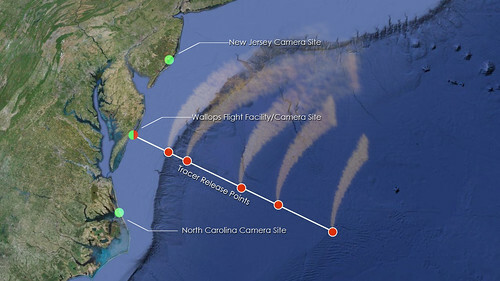 NASA’s ATREX: a mission to study high altitude jet stream winds by combo-launching five suborbital rockets from Wallops Island to release luminous trimethyl aluminum gas clouds at the edge of space over the Atlantic. The gas would disperse with the wind, allowing ground cameras along the East Coast to study the flow of air in the upper atmosphere. ATREX had been delayed repeatedly over the last few weeks by hardware, weather, and boats on the water along the flight path. Indeed, there had been boats there earlier this morning and I had been sure of another launch scrub, but launch control had opted to tweak timing and range issues by foregoing test rockets and proceeding straight to terminal countdown to stay within the launch window, and so here I was upstairs at five in the morning. 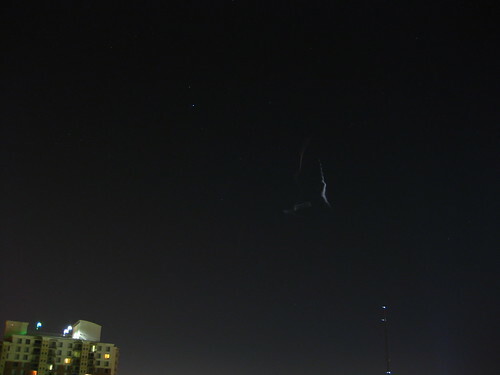 The live video stream from Wallops Launch Control turned out to be delayed about a half minute. I was still setting up my camera (really just a simple Canon Powershot on a Gorillapod) when the glow of the first Terrier rocket rose swiftly from the horizon to the east. 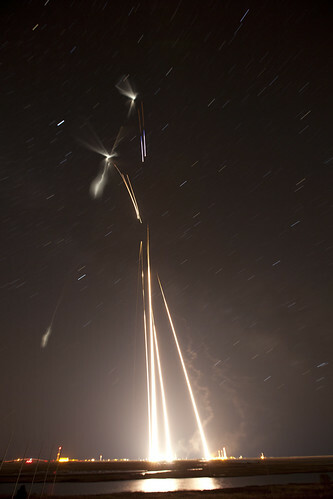 Subsequent rockets would launch on a staggered 80 second sequence; with the video stream delay that meant about another 50 seconds till the next launch would be visible. 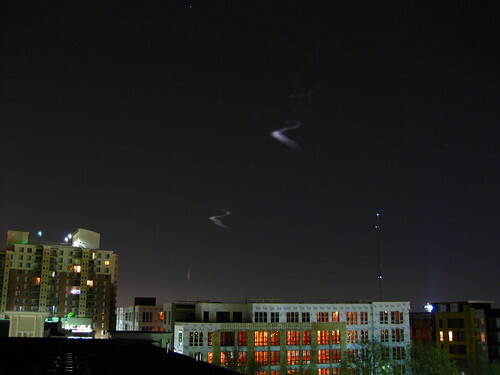 The first rocket began to glow as it released its payload of trimethyl aluminum into the atmosphere. 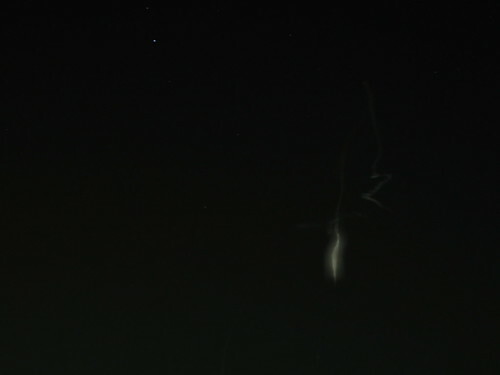 As the second, then the third rockets ascended into the night, bursts of ethereal gas began to stream forth from either side of each launch plume, burning slowly in the thin air above and forming something like a luminous, milky feather quill along its trajectory through the eastern sky. Briefly they formed symmetrical apparitions, which began to bend and curve in those winds at the edge of space. 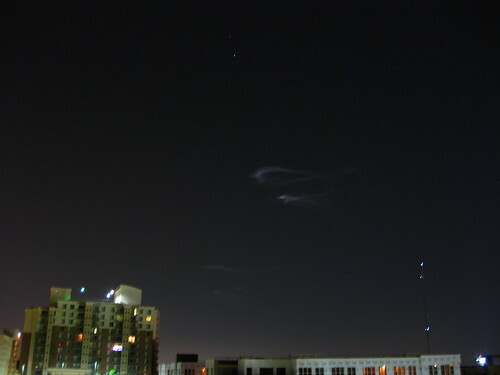 Another plume formed, then another, each subsequent rocket spewing glowing clouds as they fell into the night. Soon, five clouds had formed, all contorting into elongated C-shapes at varying altitude in the eastern sky. “Holy crap,” I said softly to myself, in violation of my own personal rule against meaningless vocalization during spaceflight events. It was just that pretty. Twenty minutes later the tracer clouds had dispersed northwards, though they still glowed faintly far above. But it was late — early? — and cold, and there was little more to see as morning approached. I later assembled the most stable sequence of images into an animated GIF showing the tracer gas dispersal pattern, and posted that to Tumblr. 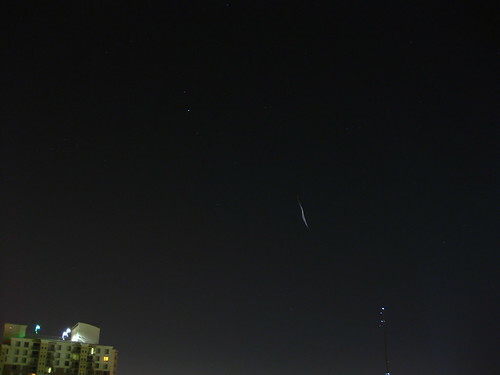 All my photos here, and also see NASA Goddard’s photos, and a much better timelapse of the rockets and gas clouds from New Jersey.